Early spring walkers will find this delightful plant under and near Junipers. 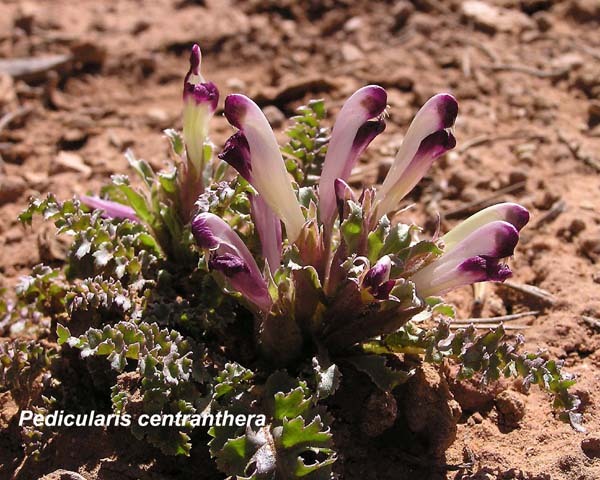 The flowers are typical of the hooded and beaked flowers of the Pedicularis genus and those pictured are an inch long. Flowers can grow up to 2 inches long. Flowers fade in a few weeks, the leaves rapidly grow much longer, and the entire plant dries and is gone by early summer. Leaves shown are about three inches long and have the typical purple cast to them. "Centranthera" refers, according to William A. Weber, to the "pointed" (Greek "centrum") and spurred "anthers". John Bigelow first collected this plant in New Mexico in the 1850s; Asa Gray named and described it in 1858.